Take the braking capability of your Camaro LT or SS to a higher level with the Chevrolet Performance Brembo® front brake system featuring six-piston monoblock aluminum calipers with performance brake pads and two-piece, 14.6” x 1.3” (370mm x 34mm) vented and slotted Duralife rotors (cast-iron braking rings with aluminum hats). These performance brakes are for the serious track enthusiast looking for ultimate braking performance while maintaining street drivability – and they’re larger than the factory systems for LT and SS (SS features 13.6” rotors/four-piston calipers from the factory). The Duralife rotors feature a hardened surface to reduce corrosion and provide quieter braking with less vibration. 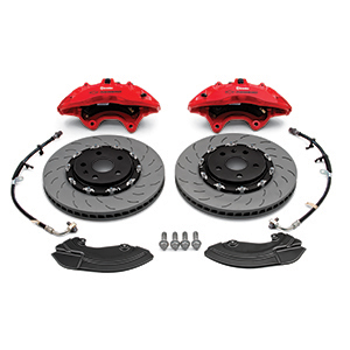 This front-brake kit is available for all Gen-6 Camaro models and includes low-expansion front brake hoses, all necessary hardware, and installation instructions.